Don't drought this episode was a good one. Matt shares an update on the Iowa drought and encourages people to use the U.S. Drought Monitor as a tool to measure landscape moisture levels. Matt and Erin transition and talk about pest activity around the state, starting with twospotted spider mite. Erin wrote a recent ICM News article that talks about scouting and managing this pest that favors hot and dry conditions. 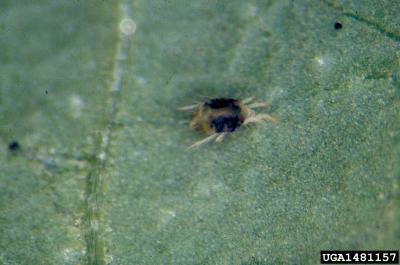 Spider mites can be first detected around field perimeters and then eventually infest the field interior. Discoloration, webbing and stunted plants are often the result of heavy spider mite feeding. Erin mentioned a new miticide, AgriMek, that has promise for suppressing mites in corn and soybean; find the label here. The conversation switched gears to talk about some corn silk clipping pests, like Japanese beetle and corn rootworm adults. Scouting to determine pest densities and potential interference with pollination is important. Learn more about Japanese beetle ID, scouting and management with an ICM News article. Twospotted spider mite. Photo by Frank Peairs, www.ipmimages.org. 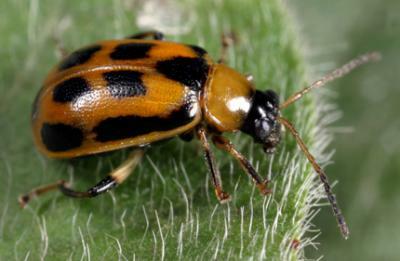 Bean leaf beetle. Photo by Marlin Rice.